It turned out really great! It has that "yuck" appeal and is extremely tasty. We also have seven cats so it was very easy to get the "reality" feeling for this cake. It looked very authentic. This is an extremely easy recipe. Looks like a lot of work but it's really not. Make brownies according to instructions on the package. Make them to fit the 9 X 13 pan. 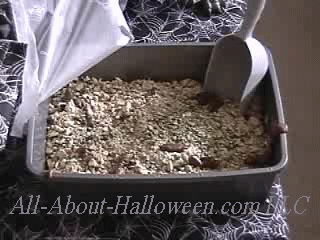 After brownies are cooled, break into large chunks and place into cat litter pan. 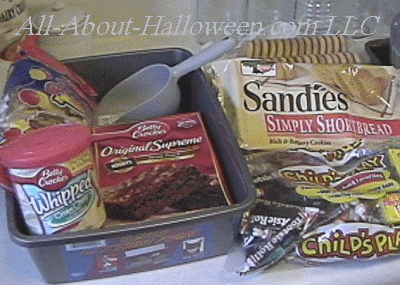 Spread frosting onto the brownies, making sure none of the brownies are exposed. Put some animal crackers or shortbread cookies in a baggie and smash into tiny bits. Using the flat side of a meat tenderizer works wonders (or hammer or anything else handy). You don't want to have a fine sand but a bit chunky (small chunky, see picture below). Take a small amount of crushed cookies and set aside in a small baggie. Make sure you have enough crushed cookies to cover the frosting. Spread the cookies on the frosting. Take the amount of cookies that you set aside and drip a few drops of green food coloring into the baggie. Seal and shake up. Try to color all the chunks in this baggie. Keep adding more food coloring until most of the chunks have some kind of green on them. Doesn't have to be perfect. Spread the green colored cookies in with the others. Get a small saucer or microwave safe plate. Unwrap about a dozen (12) tootsie rolls. You will need more if you are using the miniature tootsie rolls. Place the unwrapped rolls on the plate and microwave for about 30 seconds on 50% power. Test the tootsie roll to see if it is soft enough to change the shape. If not, repeat above. Now pinch, twist, and bend your, um...., cat droppings (poopies) into the desired shapes. Place your newly shaped "poopies" onto the crushed cookies (litter). Make sure you have the infamous "poopie" caught on the side or hanging over the edge. 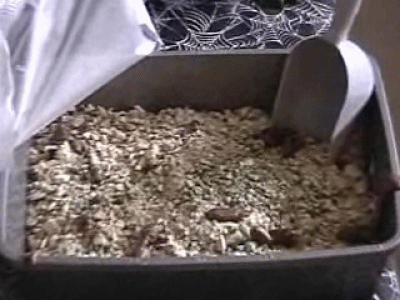 Tuck the scoop into the cat litter cake and you got it! First victim to take a bite out of your cat litter cake is scared out of their wits (or just totally grossed out.) But after that, it's a great cake! Enjoy!